"...a reproduction of that form puts him firmly in the mix at this level..."
Urban Beat is a 3-y-o sprinter going places and he could be up to completing the 4-timer. 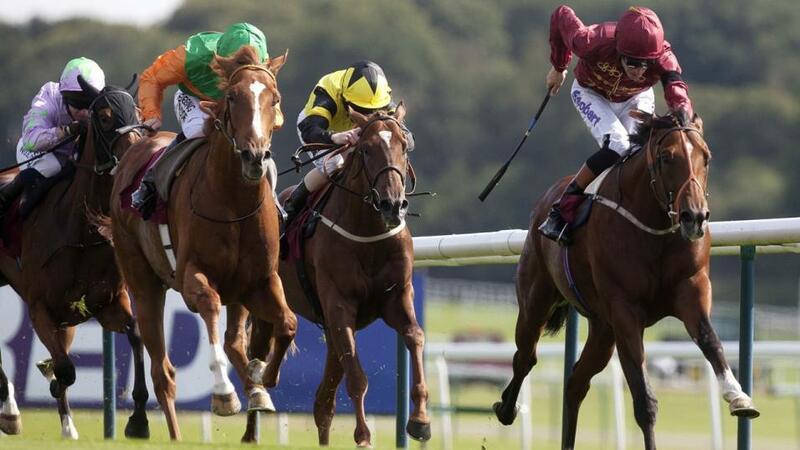 Glenamoy Lad, Miss Power and Medicine Jack are a trio of others to keep a close eye on. Eziyra's excellent third to Sea of Class in the Yorkshire Oaks at York last month is clearly the best piece of form on offer, and she will prove hard to beat with a similar kind of performance. I'm So Fancy should continue to give a good account, while Beautiful Morning may prove best of the remainder. A winner of the Sapphire Stakes here in July, Havana Grey is deserving of his fifth placed finish in last month's Nunthorpe marking up, isolated towards the far side and likely to have gone close had he raced with the main pack. He can come out on top. Hit The Bid should be spot on for his return and is feared, as is admirable veteran Take Cover. Skitter Scatter defends an unbeaten record over 7f, and her decisive win in the Debutante Stakes here 3 weeks ago (ahead of several of these in the process) marks her down as the one to beat. Main Edition brings British formlines into the equation and she may emerge as the chief threat. The form of Quorto's easy win in the Superlative Stakes at Newmarket in July is backed up by the clock and is taken to get the better of Aidan O'Brien's quartet, headed by Anthony Van Dyck. Weekender produced a very smart performance when runner-up under top weight in the Ebor at York 3 weeks ago and a reproduction of that form puts him firmly in the mix at this level. Flag of Honour was much improved to win his last 2 starts, including the trial for this over C&D, and is next best ahead of Irish Derby winner Latrobe. A wide range of abilities on show, with Flashcard easily the most persuasive option given he has passed both tests (at Salisbury) with the minimum of fuss and is a useful prospect. Barbill has been kept busy but is a definitie factor on the pick of his form, with Getchagetchagetcha completing a British-trained shortlist. Inscribe has made a cracking start to life in handicaps for Ger Lyons, posting his best effort yet when registering a third career success in a C&D handicap in May. He was far from disgraced over 1m latest and is expected to relish the return to 1¼m. Still Standing, Arthurian Fame, Danceteria and Lucius Tiberius head up an exhaustive shortlist of potential threats.